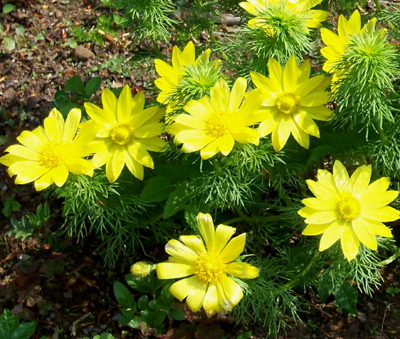 Adonis vernalis is a spring flowering perennial with fern like foliage, and cup shaped yellow flowers two to three inches across. Grow in well drained fertile alkaline soil in full sun. 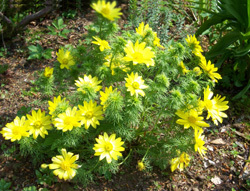 It is prone to damage from slugs, but is hardy. Adonis is named from the Greek myth of Adonis, who was the young lover of Aphrodite. 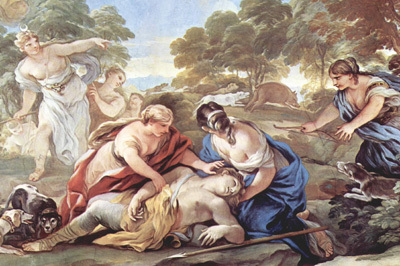 He was gored by a wild boar in the hunt and died in Aphrodite's arms, who came to him when she heard his groans. When he died she sprinkled the blood with nectar, and the short-lived anemone, which takes its name from the wind which so easily makes it fall, was produced. However there has been understandable confusion between anemones and what is now called adonis, many of both being bright red - though not the Adonis vernalis featured here.